You’d swear I’d driven to Siberia and back, but no, just from Birmingham down to Silverstone. I guess this is the reality of driving in the depths of winter; clean cars are a myth. It seems somewhat fitting that our Q5 departed after visiting such an iconic sporting venue ñ it is the S line after all. The SUV spent its last working day with me being put to work around the legendary (and full) GT circuit at Silverstone with a professional racing driver at the wheel ñ no not me. I was in the boot, taking full advantage of the optional air suspension in ëComfortí mode, to make things as smooth as possible, and help me in getting pin-sharp photos. Speaking of which, even with the dampers at their slackest settings, the ride is a lot firmer than I had expected. That said, switch into ëDynamicí mode and the car changes in character, feeling agile and flat through corners, although it does get quite bouncy, too. Itís just a shame it doesnít improve its steering, because even in the sportiest setting, itís pretty devoid of feel and feedback. I tend to drive the car in ëIndividualí mode, allowing me to customise the chassis and powertrain to my preferred settings. I have the engine, gearbox and suspension in Comfort and the steering in Dynamic, and yet I find myself often venturing into the setup page to see if itís gone back to Comfort of its own accord. In last monthís report I mentioned taking the Q5 to Paris, where it behaved wonderfully, but one bugbear made itself known. We shared the driving between three of us, so I had a great chance to experience the Q5 from the back seats. To my surprise, I actually found the rear seats more comfortable than those in the front, with a nice squishy feel. Everyone knows on a road trip with friends that you end up stocking up on drinks and superfluous snacks, and this road trip was no different. Only these purchases highlighted one snag about the Q5; itís lack of storage in the back. There are no rear cup holders, no pockets on the back of the front seats for Percy Pigs, and a total absence of any USB charging points, though you do get one 12-volt socket. You only get a small-ish pocket in each door, too. Intrigued, I consulted some YouTube reviews of the Q5 and saw the rear cupholders and netting our car is missing. Why? Thatís because theyíre optional extras as part of the £175 Storage Pack, which also gives you some extra storage up front and a lockable glovebox. I know Audi is known for its lengthy options lists, but rear cupholders being on it feels a bit mean. Thatís like Ikea giving you meatballs, but holding back on the Lingonberry sauce. Itís little things like this that made me cold towards the Q5. Iíd get annoyed, lean towards forgiveness, but then remind myself just how much the Q5 costs. 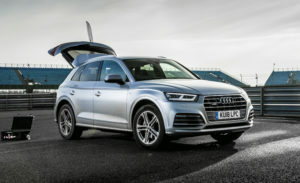 Until one day, someone said: ìNobody buys a car these days, everyone leases.î And, according to an online leasing site, a Q5 similar to ours will cost just £150 per month more than a similarly specified Grandland X. Now, as competent as the Griffin-badged car is, the kudos of those four rings on the bonnet means that many customers are likely to stump up the extra cash. So while it no doubt makes financial sense, for me itís a little too conservatively styled and uninvolving to drive, but still convincingly hits its premium SUV brief. For most customers looking for a vehicle in this class, that will be enough. Tri-zone climate control. I can boil myself up front whilst keeping the pooches in the boot cool. Quite often the engine start button needs a couple of presses before the engine kicks into life. How old is your current car?